Over the weekend, Hasbro has applied for three new Transformers related toy trademarks at the United States Patent & Trademark Office. Razorclaw, whose most famous incarnation is that of a Decepticon Predacon who is also a part of a bigger entity; The Predaking. We all know that a new Predaking is on his way as a part of the ongoing Power Of The Primes line. Therefore, this listing comes as no surprise. 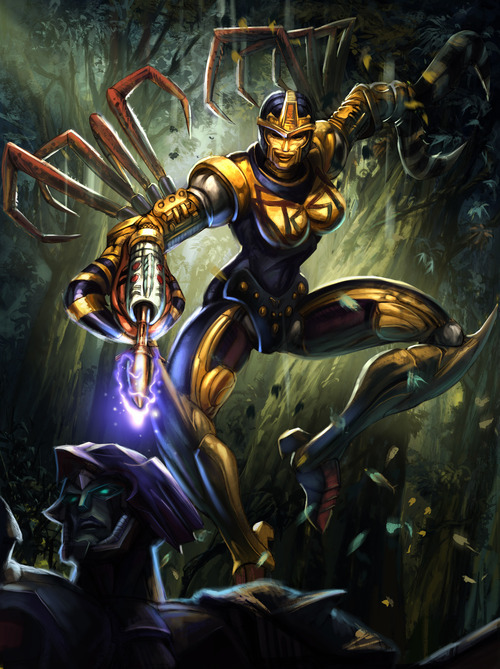 But the surprise is Blackarachnia. Known to many for her Beast Era representation, Blackarachnia later turned up on Transformers: Animated. Now however, she seems to be getting a new toy. There is a likelihood that she’ll be a part of the upcoming Transformers: Cyberverse animated series where Chapters might explore other past lines such as Beast Wars. Seems likely. Although Hasbro doesn't release Beast Wars Masterpiece figures…just TakaraTOMY. So…new Platinum boxset? Maybe a 5-pack vs set including: Universe Dinobot, Generations Rattrap and Generations Rhinox vs Legends Blackarachnia and Generations Waspinator? i hadn't thought of it before but i gotta say, Miss Arachnia is about the only character [other than my beautiful whirlybird] that i'd positively leap at an MP of…. bring me that perfect spidergirl!